Additionally, the four green lights on the wireless controller flash continuously. The Xbox 360 Wireless Controller batteries are weak, or the Xbox 360 Rechargeable Battery Pack needs recharging. Another wireless device, such as a microwave oven, a cordless phone, or a wireless router, is causing interference. Metallic objects positioned between the console and the wireless controllers are causing interference. These include a chrome faceplate or metal dividers, shelves, or doors on an entertainment center cabinet. Note All licensed Xbox 360 console faceplates are tested for interference and do not interfere with licensed wireless devices. Four controllers are already connected to the console. If you don’t have a rechargeable battery pack, insert fresh AA batteries. Slide the AA battery pack into the controller, and then push in to close. 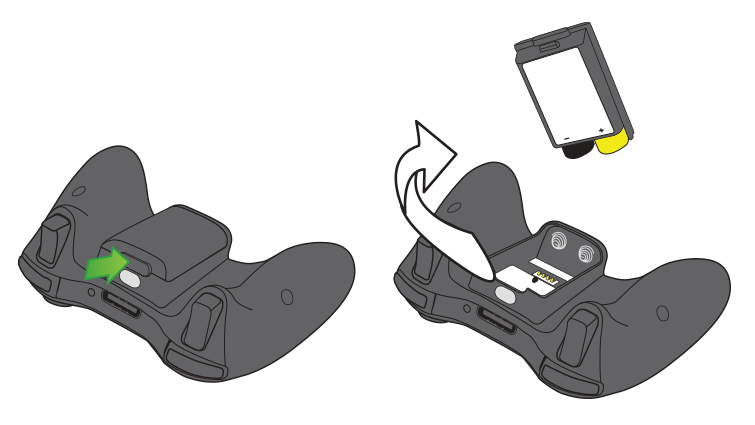 Remove the battery pack and reattach it to your controller, making sure that it’s attached correctly. On the controller, press and hold the Guide button . In the upper-left corner, the battery meter indicates your current level of battery strength. If the level is low, recharge the battery pack. Make sure that the battery pack is correctly connected to your controller and plugged into one of the console's USB ports. If you’re still having the problem, try step 2. Plug the charge cable into each USB port on your console, one by one. There are USB ports on the front and back of the console. If the controller works in one USB port but not another, try another accessory in the USB port that didn’t work with the controller. If the USB port doesn’t work with any accessory, your Xbox 360 console might need to be repaired. Contact Xbox Support. If the USB ports work, but you’re still having connection problems, try step 3. Select Enable Vibration to clear the checkbox. Turn your console off, wait a minute, and then turn it on again. If you have access to another controller, try that one to see if it works. If so, then the first controller may be faulty. If not, there may be a problem with the console. If you have access another console, try the controller on that one to see if it works. By doing this, you can narrow down whether the problem is with the controller or the console. If this problem happens when using multiple controllers, try rearranging your play area, or move the console to a different location or room. The controller may have lost its connection to the console. To resync your controller with your console, see Connect a controller to your Xbox 360. If all four lights surrounding the power button on the console are green and the controller has four flashing green lights, four controllers might already be connected to the console. Disconnect all of the controllers, and then try to connect the controller with the problem. To disconnect a wireless controller, press and hold the Guide button for three seconds, and then turn the controller off. To disconnect a wireless headset, turn the headset off. To disconnect a wired controller or headset, unplug its cable from the console. Learn more about connecting a controller to your Xbox 360. If your controller still doesn’t work correctly, it’ll have to be replaced. You can order a replacement Xbox 360 controller from the Device Support. You must register your console to replace a controller under warranty. See Warranty and service: FAQ to check the length of your warranty. Would you like to contact Support regarding the "Xbox 360 Wireless Controller disconnects or can’t connect" issue you were reading about or a different issue?